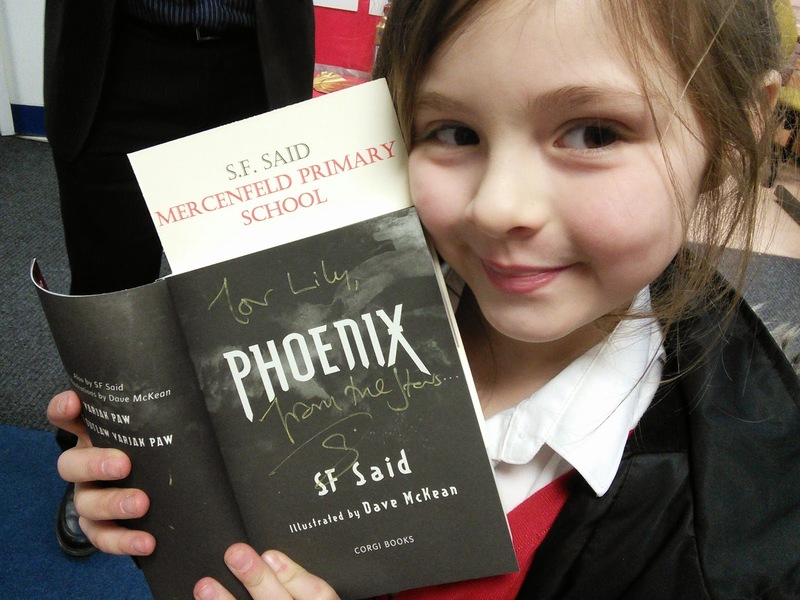 I'd like to say a very big thank you to Amber Rao and everyone I met at Mercenfeld Primary School for the fantastic welcome they gave me when I visited last week! I met so many brilliant readers and writers from Years 6, 5, 4 and 3. 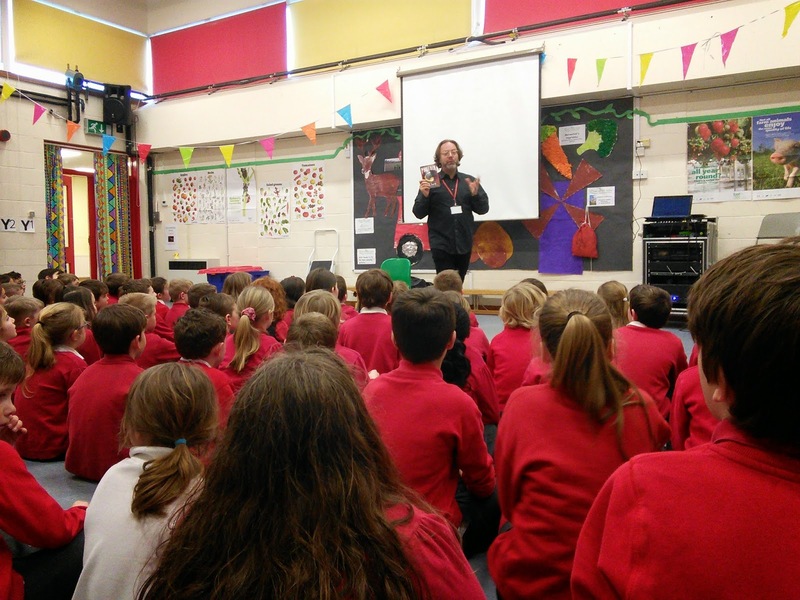 It was wonderful to see such enthusiasm for reading, to hear about everyone's favourite books, and to answer some really interesting questions about writing Varjak Paw and Phoenix. We didn't have quite enough time to answer all the questions, so if anyone has more questions, or would like to say anything about the visit or my books, just leave me a comment below. But I was very glad to be able to sign books for everyone who wanted one – so thank you all again for a fantastic visit! PS! 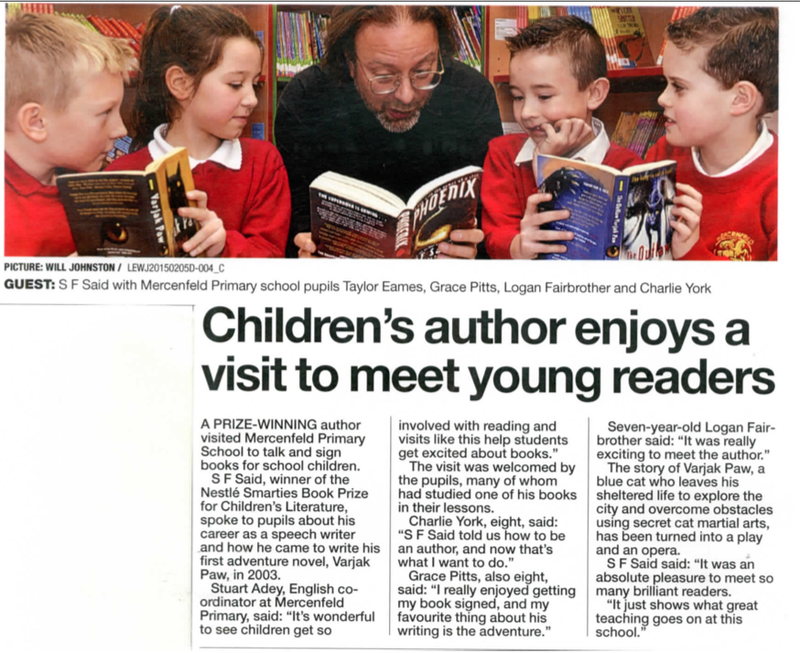 Here's a lovely article from the Leicester Mercury about my visit to Mercenfeld! Thank you so much for your fantastic comment! It was a real pleasure to meet you all. I loved your Varjak Paw display; it was amazing to see and hear about all the brilliant work you've done. And I'm so glad to hear you're enjoying Outlaw too! I am reading vajak paw but i am really looking forward to reading your other to books. How long have you been an author. How long did it take you to make all three books. 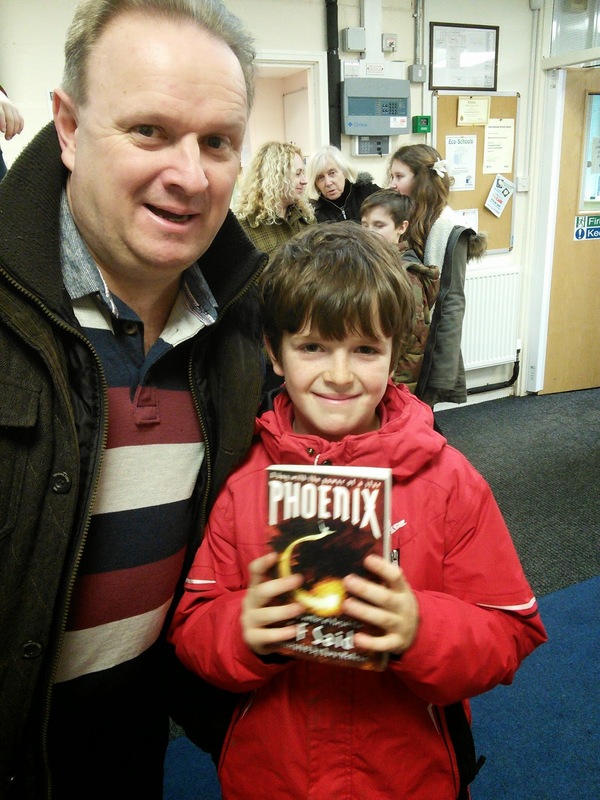 Why did you choose to make Phoenix longer than the Varjak paw books. How many schools have you been to. What made you decide you wanted to be an author. How many books are you hopping to make. Do you have a wife. How popular do you think your books are. I love your books from Ryan! How long did it take you to make all three books? Varjak Paw took me 5 years to write. The Outlaw Varjak Paw took 3 years. Phoenix took 7 years. So those 3 books took 15 years in total! How many schools have you been to? That's a great question! I honestly don't know how many schools I've visited in total now – I lost count a long time ago. I did my first school visit in 2003. Last year, I visited about one school a week on average, during term-time. So it's definitely a lot, anyway! How many books are you hoping to make? As many as I can. But I want each of my books to be as good as it can possibly be. And that always takes a lot of time and hard work. That's why Phoenix took 7 years: because before then, it just wasn't as good as I wanted it to be. So the quality of the books is more important to me than the quantity. I'd rather write a few really great books than lots of not-very-good ones!